You can improve any asset or process by realizing three types of opportunities: eliminate known failures, mitigate latent risks, and pursue upside performance towards the theoretical best. For your car, this would mean: fixing the broken brake light, replacing the power steering pump before it fails, and improving the fuel efficiency to 80 mpg and beyond. Most businesses fail to improve at a fast enough rate to survive because they pursue opportunities in that order. Usually we make decisions with both the head and the heart, and it’s easy to devote resources a problem that annoys your customers, frustrates your employees, or simply causes your phone to ring in the middle of the night. What’s missing from this approach? No news is good news, right? First, you leave a tremendous amount of opportunity on the table without exploring the opportunities beyond the perceived constraints and self-imposed limitations. Why is the maximum speed of that machine exactly 100.00 widgets per hour? What law of chemistry caps our yield at 80.00% Find out what these limits are worth, and challenge them. Second, and possibly more important, is the risk that your organization does not push its own boundaries of knowledge. Long-standing problems will be tolerated, and more procedures, safeguards, and inspections will crop up to prevent likely defects rather than pushing to a true “root cause” understanding of what allowed the opportunity to exist in the first place. Without a healthy curiosity in the culture, attrition will take valuable process knowledge out of your organization. 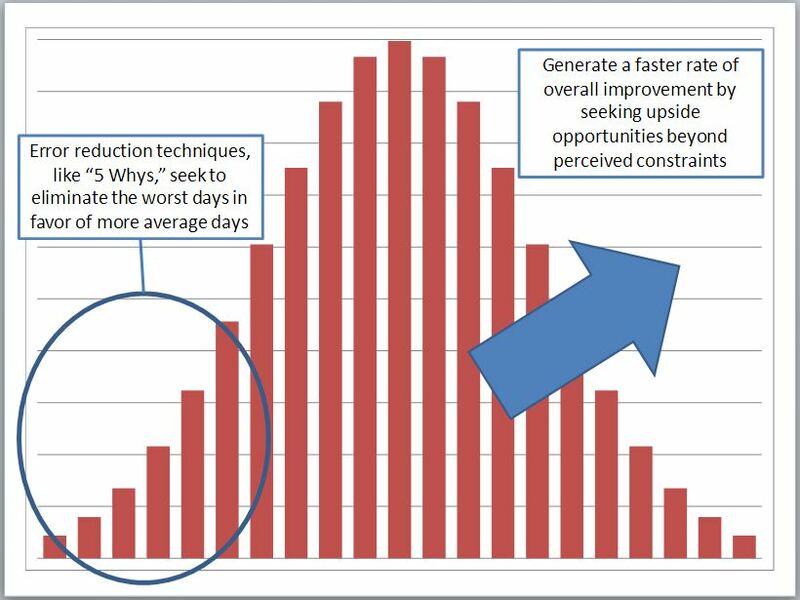 You may have seen a tidy video blog post by Eric Reis at HBR describing how to use “5 Whys,” a tested problem solving method from the manufacturing industry, in an IT setting to address human errors. Good concept for sure, and a lot of folks in that space will benefit from the relative novelty. What worries me is this advice reinforces a leader’s misplaced attraction to high visibility, low value problems that have long lead times to fix–the solution is more training!–and very little certainty that the problem will be gone forever. Continue to chase known defects (mention “sigmas” and I will have a Hulk moment), and your business will stay afloat, but you will never leapfrog your competitors. You will find yourself requesting more capital to supplement equipment that is “maxed out,” chasing price increases to maintain margin rather than improving your cost base, and scratching your head wondering why your business just can’t run steady anymore. You can’t ignore defects, breakdowns, and errors. But to improve at the fastest rate, balance this approach with a healthy, fact-driven pursuit of upside potential. For more information, read this article I co-authored with Dan Kubiak in Industrial Engineer Magazine. Helpful look at putting 5 Whys into perspective as simply going after the known failures. Yes! Finally someone writes about face.